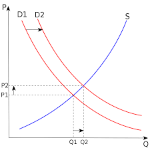 Quantity demanded represents the amount of an economic good or service desired by costumers at a fixed price. Demand is the willingness and ability of a person to purchase an item. Law of demand states that the quantity demanded for a good rises as price falls, this shows an inverse relantionship. Law of Supply is the fundamental principle of economic theory which states that an increasing in price results in na incseing quantity supplied, this is a direct relationship. Elastic -type of elasticity in which a change in the independent variable results in larger change in the dependent variable. Inelastic -case of demand elasticity where the percentage change in the dependent variable results in a larger change in the dependent variable. How supply and demand determine equilibrium price and quantity. Role of buyers and sellers in market. In a marketplace buyers aim for the lowest price and sellers want to sell for the highest price. If the price is set too low the supply would be sold before satisfying the demands of the market, causing a shortage. The raising of prices too high will create surpluses because the demand is less than what sellers can offer.